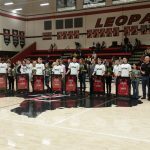 Friday, February 10, 2017 7:00 PM Highland Park – Senior NIght AWAY 65 Lovejoy High School HOME 60 Game Recap The Leopards played a tough up and down game against Highland Park, but fell short in the end on Senior Night. The Leopards scored well collectively, but didn’t do the job on Defense they needed. Thursday, February 2, 2017 7:30 PM Lovejoy High School AWAY 30 Allen Ford HOME 25 Game Recap The Willow Springs 8th grade boys basketball C team was victorious against Allen Ford. This was a great win for the C team coming off their district championship win!